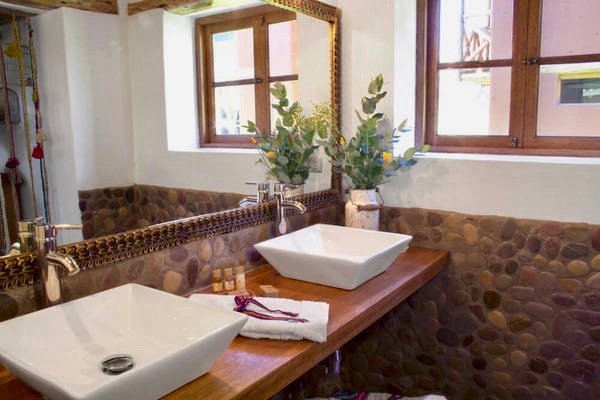 Step into the grounds of Nunu’s Boutique Hotel and prepare to be blown away by dramatic mountain scenery, top notch hospitality and incredible interior design which oozes personality and charm. 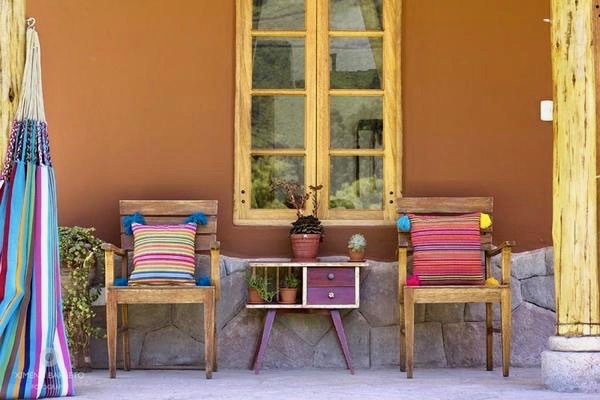 There is nothing here that has not been given a tremendous amount of thought - from the brightly coloured wooden chairs that have been converted into plant pots to the bright Peruvian-patterned handmade cushions where every bead and tassel has been sewn with purpose and love. 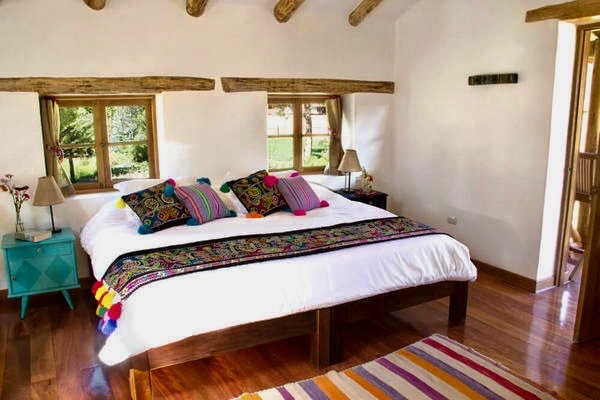 Nunu’s is the creation of Peruvian couple Javier (a former lawyer) and Michelle (a former graphic designer), who left the hustle and bustle of Lima with their children in tow to create their dream boutique hotel in the shadows of the towering mountains that form the majestic landscape of the Sacred Valley. Entirely made from reclaimed materials, the couple spent two years collecting and renovating furniture from all corners of the country to create the unique space you will find today. 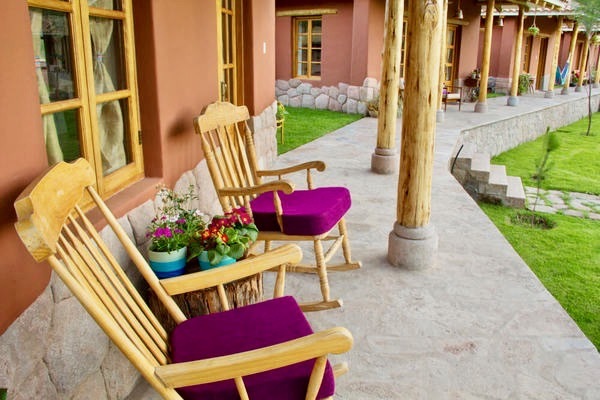 There are a total of just six detached bungalows (or ‘casitas’ as they are known in Spanish) and each has its own theme. 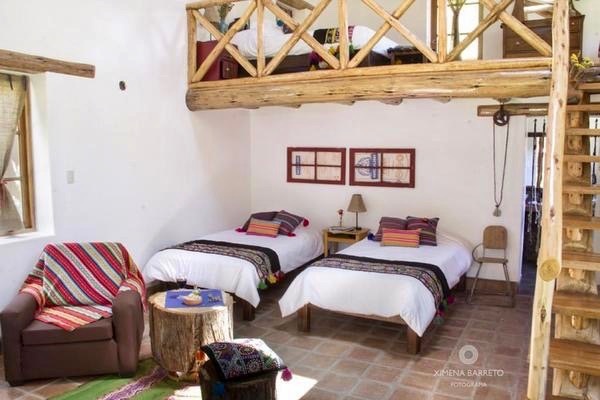 Three are duplex casitas with a twin bed downstairs and a double upstairs (in an open plan style) with one large bathroom downstairs, ideal for families. 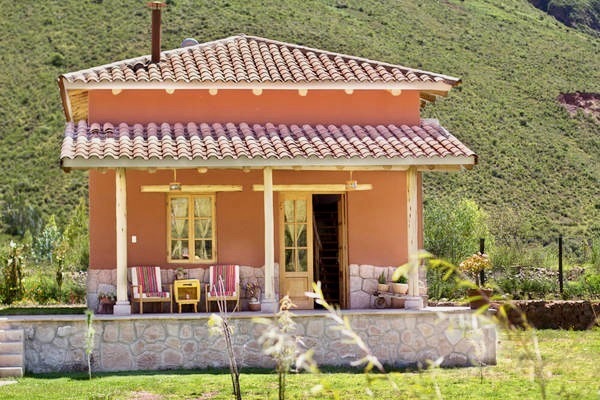 The other three are single-storey with just one double (or twin) bed and ideal for couples. 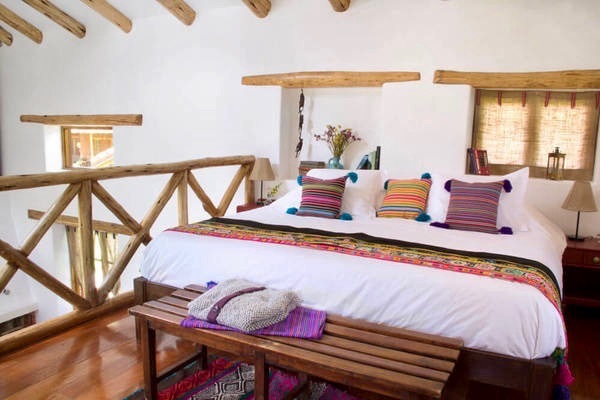 All casitas feature freshly painted white walls with high beamed ceilings whilst crisp white bedding is brought to life with brightly patterned Peruvian fabrics, bed throws and cushions. The family duplexes boast wood burners and the doubles heaters, making them delightfully cosy in the cooler months, and all have spacious terraces looking out onto the pretty grounds with chairs and a hammock for ultimate relaxation in the summer. That’s where the similarity ends between the rooms. 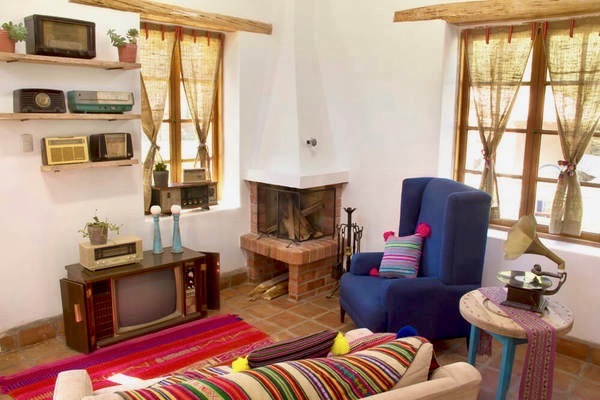 Each casita has its unique theme, for example the Music Lover duplex room features a stunning antique gramophone and collection of retro radios and records pinned to the wall, whereas the Seamstress double room is home to a beautiful collection of vintage sewing machines. Other themes include the Explorer duplex room, with an intrepid traveller theme where old muslin-clothed wheat and rice bags from around the world have been recycled, and the English Tea duplex room which has a soothing gardener’s theme. Meanwhile, the Chef double casita will transport you to a bygone world of culinary treasures whilst the Shoemaker’s double room is sure to inspire dreams of the cobblers’ heyday in the 1930s. 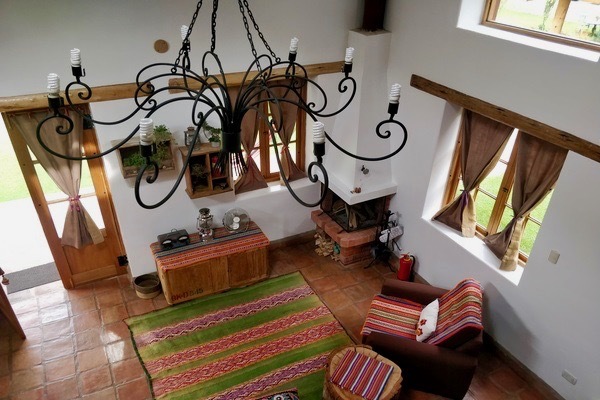 The rooms all back onto the mountains but some have views of the owner’s house and others have more dramatic views - we especially love the river views from the Explorer duplex casita. In the separate dining room you will find all the lovingly restored trinkets and art work that didn’t make it into the casitas, making for a light, airy and beautiful space where you will enjoy a fresh breakfast (and dinner if you choose) made with many organic ingredients from the garden. Lunch is not normally available but can be arranged with some advance notice. 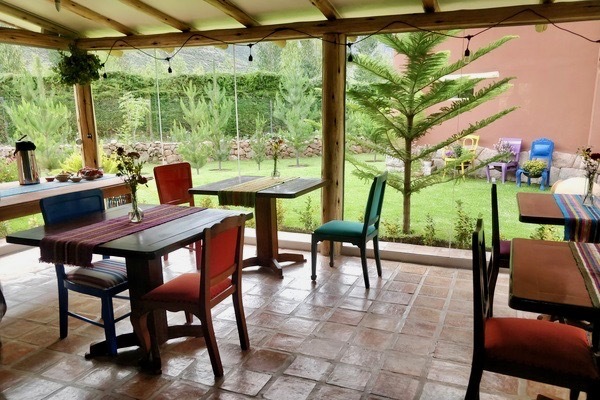 Nunu’s Boutique Hotel is located about 15 minutes from the historic market town of Pisac and taxis can be arranged if you would like to dine out but it should be noted this is very much a rural location with little evening entertainment etc. The hotel cannot presently accept MasterCard so Visa or cash is preferred for payment.